Myrah and the 30 year old apple. For most of the people reading this blog, you probably already know that I have a 3 month old daughter. For those of you who didn’t know, well, take this as an announcement. It’s something new everyday. She’ll babble in her sleep, squeal in delight, flip over, give you the biggest smiles, just win your heart over day after day. There is no greater feeling than seeing your daughter recognizing you and give you her best, biggest toothless grin. In my daughter’s case, when she smiles wide, her eyes crinkle up, as though there’s only room for only one of them to be open at one time. Coming to the point, the other day, I walked into my Mum’s room (Grandma was babysitting), and I see my daughter playing with this plastic Apple. It’s not a great, sophisticated toy. It’s made by fisher-price and it rocks on it’s base when you knock it around. There’s probably a small bell inside which tinkles on being moved. So all in all, it’s just an apple with a bell. No biggie. The only thing is, it’s MY Apple. My parents bought it for me when I was a newborn. And then, as with everything in my house, it’s been safely hoarded preserved for almost 30 years. It was so surprising to see my daughter play with it. 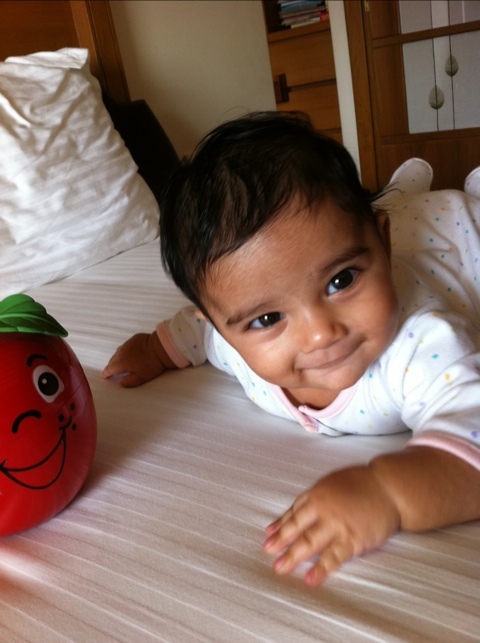 Knocking it around, staring at it wide-eyed, chuckling, having a conversation with a bright red plastic apple. It was heart-warming. It’s true when they say that the best toys are the simplest ones. It’ll be so cute if she grows up to be one of those kids that throws away the toy and plays with the box. I give my Mum such a hard time about her wanting to preserve old, useless things. I sure am glad she kept the apple though. Moral of the story, Grandma knows best.